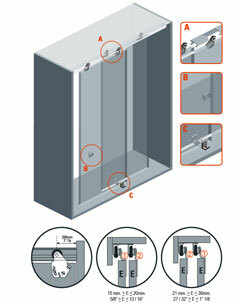 Top sliding system for bypass doors installed inlay the opening. Ideal for closet applications. One box with all you need to install 2 doors, just order the track and you are ready to go. Galvanized steel double track predrilled for easy and fast installation. Floor guide adjustable to different door thicknesses. Bumper between doors to avoid total overlap.